Beautiful SCARCE stock certificate from the J. I. Case Threshing Machine Company issued in 1907. This historic document has an ornate border around it with a very rare color vignette of an eagle "Old Abe" sitting on a globe (In 1865 J. I. Case Company adopted the Civil War eagle "Old Abe" as their logo.). This item has the signatures of the Company's President, Frank K. Bull and Secretary, Frederick Robinson and is over 103 years old. Gold embossed corporate seal. Jerome Increase Case (1819-1891) was born in 1819 to a New York State farming family. As a young child, Case read an article in the Genessee Farmer magazine about a machine that could cut wheat without people needing to use their hands to aid it. He developed an interest in agriculture at that point. In 1831, the first reaper machine was demonstrated at Steele's Tavern, Virginia, by Cyrus Hall McCormick (McCormick Tractor). This moment has been considered by many agriculture experts as a key moment in farming history. Jerome Increase Case took a small, hand-powered threshing machine from Williamstown, New York to Rochester, Wisconsin, where he fixed the machine and established the J I Case company. 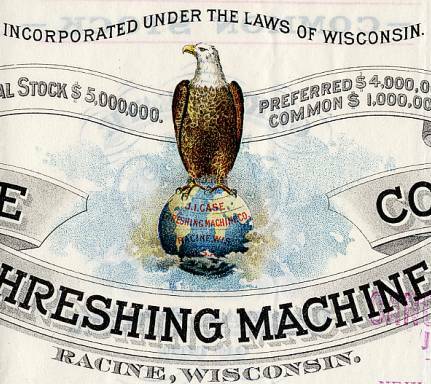 In 1843, J I Case thresher moved to Racine, Wisconsin, in order to have better access to water and facilities where more threshers could be built and repaired. In 1863, Case sought partnership with three other farmers, Massena Erskine, Robert Baker and Stephen Bull. These four would later be nicknamed "the big four" of the farming industry. 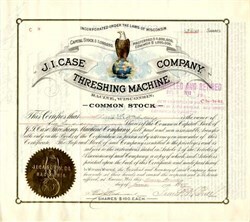 In 1842, Case created the J I Case Company. He was later recognized as the first American to create a steam engine for agricultural use. Case was also involved in politics, becoming mayor of Racine three times, and state senator twice. He was also involved in other endeavors, such as science, arts, banking, and president of several Racine agricultural associations. He was also a race horse owner. As stated above, McCormick devised his famed wheat reaper and started his legendary binder business. The McCormick Company eventually moved to Michigan Avenue, in Chicago, Illinois, across from the Wrigley Building. In 1859, McCormick's reaper earned a gold medal award at the Royal Exposition, in London, England. 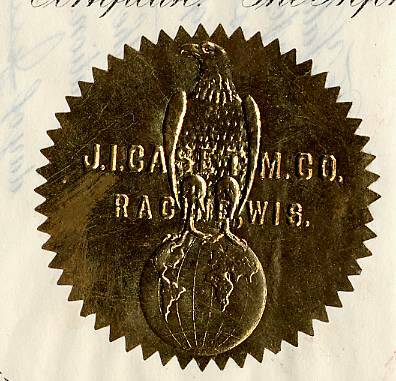 J I Case introduced an eagle logo for the first time in 1865 after a legendary Wisconsin Civil War Regiment's mascot. Case constructed his first portable steam engine in 1869, an engine used to power wheat threshers. This engine is in the Smithsonian Museum in Washington, DC. Case won first place at the 1879 Paris Exposition in France for his thresher; this was the first thresher sent abroad by the Case company and was the first of thousands which would later be exported internationally. It is at this time that Case created his first self-propelled traction engine, with a drive mechanism on one of his portable engines. Another interesting piece of trivia: Case made a visit to a farm named after him in Minnesota during 1884, upon receiving news that one of his thresher machines was not working. Infuriated by the fact that he could not fix the machine himself, he set it ablaze the next day, and sent the owner a brand new thresher machine upon return to Wisconsin. In 1890, the Case Company expanded to South America, opening a factory in Argentina. In 1891, the company's founder, Jerome Increase Case, died at age 72. By this time the Case company produced portable steam engines to power the threshing machines, and later went into the steam traction engine business. By the turn of the century Case was the most prolific North American builder of engines: these ranged in size from the diminutive 9 HP, to the standard 15, 25, 30, 40, 50, 65 HP and up to the plowing 75 and 80 HP sizes. Case also made the large 110 HP breaking engines with its notable two story cab. Nine massive 150 HP hauling engines were made, in addition to steam rollers. Case engines were noted for their use of Woolf valve gear, feedwater heaters, and the iconic 'eagle' smokebox covers. By 1895, the Case Company had begun to produce gasoline engines. By 1899, the Case Company entered the Russian market. By 1902, six major American agricultural manufacturing companies decided that a consolidation was needed, and so the McCormick Harvesting Machine Company, the Deering Harvester Company, the Plano Manufacturing Company and four others merged their companies, rebranding the new company conglomerate as International Harvester Company. It became a giant in the industry. In 1901, Frank K. Bull, son of Stephen Bull, became president of the company. In 1904, Case had introduced the first all steel thresher machine. Case sold their first gasoline tractor that year, and established a continuous presence in most of Europe when the company won the first place in a plowing contest held in the so called "old continent". Case at this time developed a wide line of products: threshers, binders, graders, water tanks, plows, buggies, and even automobiles. Case manufactured automobiles for a few years. A Case 1920 7-passenger touring car. The advent of oil engines by the turn of the century, suggested a change on the horizon. From Froelich's first tractors to Hart-Parr products, oil tractors seemed the way ahead. Case hired Joe Jagersberger, and he tested a motor by racing in the 1911 Indianapolis 500. Case began production of the 30-60 oil engine in 1912. Case also produced kerosene tractors in the teen years, similar to the Rumely oil pulls. During World War I, Case's sales and demand grew dramatically in Europe. These increases were directly connected to the war; as many farm laborers became soldiers, each remaining farmer must become more productive, and machinery was the way to make this happen. In 1919, the John Deere Company entered the harvester business, and International Harvester's reply to their new competition was to purchase the P&O Plowing Company of Canton, Illinois, and the Chattanooga Plowing company of Chattanooga, Tennessee. Henry Ford also entered the tractor business with his Fordson Tractor produced at the massive Rouge River plant. During 1923 a so-called Tractor war ensued, a four-way struggle between Ford Motor Company, John Deere, Case, and IHC. Ford, with a massive advantage in manufacturing capacity and distribution, had the upper hand, producing an estimated 73 percent of all American tractors, with Case-IHC in a far away second place at nine percent, and several other companies sharing the rest of the percentages. Also in 1923, the IH Farmall entered the agricultural industry. Farmall would later become part of Case IH. That same year also, the 100,000th thresher machine produced by Case made its way out of the assembly line, marking an important milestone for the Case company. In 1928, another name change came for the company, this time as the J. I. Case Company, while it ceased building its legendary steam engines the year before. Case steam engines, of which over 30,000 were produced, were painted in black with green machinery, while the gas tractors were painted grey. Later in the twentieth century, Case changed its color scheme to orange, with the excavators being a ruddy yellow. By 1929, Case had expanded to Australia, Mexico, Sweden and other countries. Also that year, The J.I. Case Company produced its first crawler tractor. During 1935, Case tested the first WD-40, a diesel tractor, in Nebraska. S and V tractors were introduced in 1940. Case evolved as World War II arrived, becoming involved in the manufacturing of shells for the United States and allied forces military, as well as airplane parts for the B-26s, and bombs. Three new plants were opened across the United States during that year, and, in 1942, the company produced its first self-propelled combine � a Model 123 SP harvester. That same year, Case released the company's first cotton picker, which is currently preserved by the Smithsonian society. Case IH Combine circa 2006.In 1947, the "C" was dropped from International Harvester's "IHC" logo, with the company using the logo "IH" since. A Farmall factory was opened in Doncaster, United Kingdom. By 1958, the International Harvester company was selling the Model 560 tractor, at that time considered by many farmers to be the latest in farming technology. For the next 31 years, the company went through more globalization, becoming a well-known company in the agricultural markets of Australia, Japan, and other places. Many other companies joined Case during this period. In 1984, Case parent Tenneco bought selected assets of the International Harvester agriculture division and merged it with J.I. Case. All agriculture products are first labeled Case International and later Case IH. In 1996 Austrian tractor builder Steyr Tractor was purchased. The Case Corporation joined with New Holland N.V. to become CNH, now CNH Global, in November 1999. Because of the merger CNH is forced to release its production plants in Doncaster, England and Winnipeg, Canada. The Doncaster site is bought by the ARGO-group, owner of tractor builder Landini, and brings back the McCormick brand. The plant in Winnipeg is taken over by the Buhler family to start Buhler Tractors. In Europe the merger with New Holland (including the former Fordson and Fiat tractor lines) was the success Case IH expected. In 2006 Case IH came with a plan to bring back the "International"-feel to their products. They changed their logo, bringing back the old International Harvester logo and made more technical difference between the two brands. FREDERICK ROBINSON. In every community, great or small, there are found men who by reason of personal attributes, enterprising spirit and natural ability, have arisen above their fellows in business, social and public life. Racine. Wis., has numerous examples, and one of these is Frederick Robinson, vice-president of the J. I. Case Threshing Machine Company. Mr. Robinson was born in Kenosha, Wis., Nov. 15, 1862. son of Frederick and Ann Maria (Bertholf) Robinson. Mr. Robinson was reared in his native town, where he attended the public schools, and later Lake Forest Academy. His business, life started in the office of the National Vehicle Company, at Racine, as office man. and in 1887 he went to Denver, where he engaged in the manufacture of architectural iron work for several years. In 1896 he returned to Racine and became purchasing agent for the J. I. Case Threshing Machine Company. In 1897 he was one of the purchasers of the entire stock of the J. I. Case Threshing Machine Company. Mr. Frank Bull was made the president; Mr. Frederick Robinson, vice-president: Mr. Richard T. Robinson, secretary, and Mr. Charles Mclntosh, treasurer. The J. I. Case Threshing Machine Company is one of the largest threshing machine manufacturing companies in the world, and the goods find sale throughout the United States, Canada, Europe and South America. Mr. Robinson was married in 1887 to Miss Lillian M. Bull, daughter of Stephen and Ellen C. (Kellogg) Bull, and to this union have been born two children : Stephen Bull and Bessie. Mr. Robinson is a man extremely domestic in his tastes, devoting much of his time to his family and to his home. He is a liberal patron of art, having probably the finest collection of oij paintings in this part of the State, having selected a number of them with great care in his travels abroad. His home at No. 1012 Main Street also contains many interesting curios and valuable bits of art collected in his travels. Mr. and Mrs. Robinson are members of the Episcopal Church. Mr. Robinson is a trustee of Racine College. Politically he is a Republican, but is too much taken up with business to get into politics. Old Abe (1861? � March 28, 1881), a female bald eagle, was the mascot of the 8th Wisconsin Volunteer Infantry Regiment in the American Civil War and is the screaming eagle mascot depicted on the insignia of the U.S. Army's 101st Airborne Division. Old Abe was also the trademark eagle on the globe of the Case tractor company. Old Abe was captured in 1861 by Chief Sky near the Chippewa River, near the town of Jim Falls, in Chippewa County, Wisconsin. She was subsequently traded to local farmer, Daniel McCann, for a bushel of corn, who in turn sold her to the 8th Wisconsin's Company C for $2.50. Old Abe and the Color Guard at Vicksburg July 1863 from left to right Ed Homaston, Christopher Darius Gorman, Sgt Ambrose Armitage, (unknown), Myron Riggs and 3 more unknowns. Company C named the eagle after President Abraham Lincoln, and designed a special perch on which they carried the bird into battle. Old Abe participated in the Second Battle of Corinth (in which the 8th Wisconsin lost half of its men) and the Siege of Vicksburg, among other battles. In battle, Old Abe quickly became legendary, screaming and spreading her wings at the enemy. Confederate troops called her the "Yankee Buzzard" and made several attempts to capture her but never succeeded. Several times she lost feathers to bullets and saw her handlers get shot out from under her. When passing by, Generals Ulysses S. Grant, William T. Sherman, and William Rosecrans were known to doff their hats at the eagle. In 1864, Old Abe returned to Wisconsin with several veterans who did not reenlist. Nevertheless, she remained famous and was invited to, among other events, the 1880 Grand Army of the Republic National Convention, and the 1876 Centennial Exposition in Philadelphia, Pennsylvania. When not at public events, her caretaker kept her in the Wisconsin State Capitol. After the eagle's death in 1881, she was mounted and remained a centerpiece of the capitol. The mount, along with most of the capitol building, was destroyed by fire in 1904. The insignia of the U.S. Army's 101st Airborne Division is a depiction of Old Abe. The design is based on one of the Civil War traditions of the state of Wisconsin, which was the territory of the original 101st Division after World War I. The black shield recalls the Iron Brigade, the famous Civil War unit composed of western regiments (although not the 8th Wisconsin). Old Abe was adopted as the trademark of the J. I. Case agricultural equipment manufacturing company in 1865. The trademark was retired in 1969. Old Abe is the mascot of Eau Claire Memorial High School, whose athletic teams are known as the "Old Abes", and of Racine Case High School, whose teams are simply the "Eagles". Old Abe on the 101st Airborne Division shoulder patch. A replica of Old Abe presides over the Wisconsin State Assembly Chamber. New Madrid and *Island #10 - March & April 1862 Union General John Pope captures Point Pleasant, Missouri, and provokes Confederates to evacuate New Madrid. The Confederates abandon arms and provisions, valued at one million dollars, during their escape across the Mississippi River to the eastern bank and to Island No. 10.